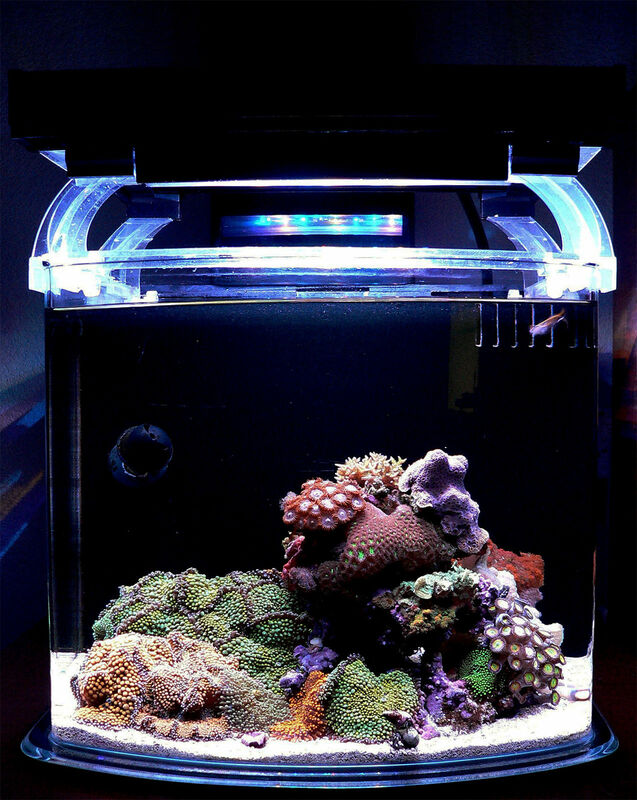 Congratulations to community member Nano sapiens and his 12 gallon nano reef for being selected for our August 2018 Reef Profile. This magnificent little reef is celebrating its 10th anniversary, standing as a true testament to the long term success of all natural nano reef systems. Below is the aquarium profile Nano sapiens has written for us sharing his experiences in the hobby and this aquarium's journey over the past 10 years! See what he's been up to and share your comments and questions in the comments section below. Be sure to follow his aquarium journal for additional photos, history, and information about this lovely reef tank. Hard to believe that another 5 years has gone by… for those who haven’t seen my original TOTM from back in August 2013, you can find it here. Detritus Removal: Live rock 'basting', gravel vacuuming plus filter sock use weekly. Rear chambers vacuumed monthly. Vacuuming under live rock every few months. Fish: (2x/day) rotating combination of live, frozen and dried foods: Rod's Food, Mysids, Ocean Nutrition Prime Reef Flakes and garden earthworms once a week. Corals: Reef-Roids and meaty foods twice a month. Return pump disassembled/cleaned every three months. Heater cleaned every six months. Setup in July of 2008 using live rock, sand, and some coral from my retired 9 year old 55 gal reef tank. Now 10 years old, August 2018. The only major changes since 5 years ago are the switch to a full DIY LED array and the removal of a large, overgrown M. Setosa colony. Since the last TOTM the system has been rock solid…and hopefully it will stay that way. Thoughtful system setup, parameter stability, patience and perseverance will go a long way towards success. Trial and error are normal parts of the learning process, so take it in stride when something doesn’t work out 100%. Try not to jump on the ‘quick fix’ bandwagon as a mature stable system requires lots of time and patience and no amount of rushing is going to change that! ‘Clean’ vs. ‘Dirty’ Systems (aka ‘Low’ vs. ‘High’ nutrient): I’ve run both and for the long term I prefer a lower nutrient system since it is much easier to clean up each week (when one considers 10 years and the resulting 520 cleanings, it’s an important consideration to me). Also of importance in a small nano with limited space, coral growth tends to be slower when nutrients are less abundant. 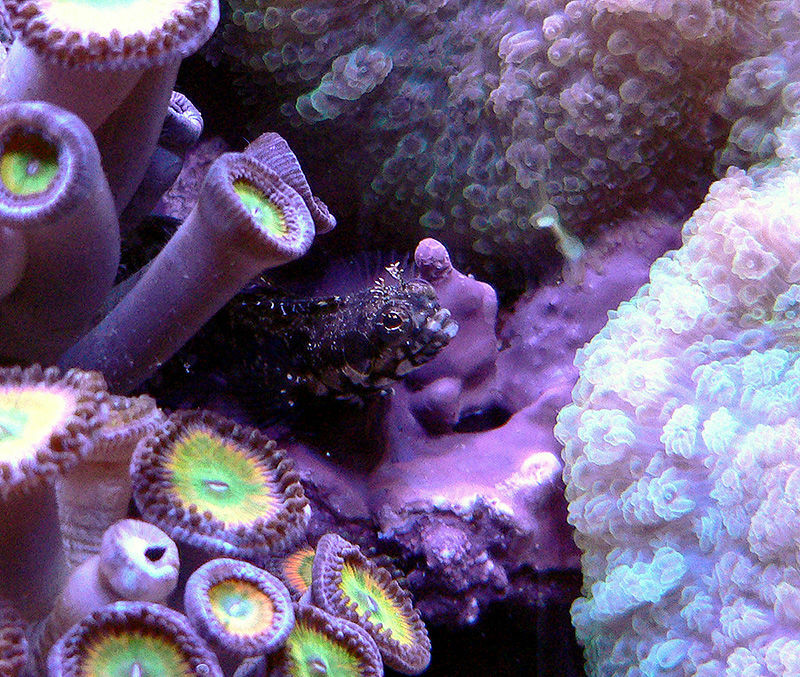 Fish: Some of the little nano gobies have been in the tank for 2-1/2 years now. This well seasoned system currently has 6 small adult fish. While this is possible when a system is mature and balanced, I wouldn’t advise this many in a new or young setup. If one likes Barnacle Blennies, try to find the ‘Eyebrow Barnacle Blenny’ (Ekemblemaria myersi). IME, they have been much hardier than the ‘Hancock’s Barnacle Blenny’ (Acanthemblemaria hancocki). Despite the literature, adding two Green Banded Gobies doesn’t necessarily mean that you’ll end up with a male/female pair. 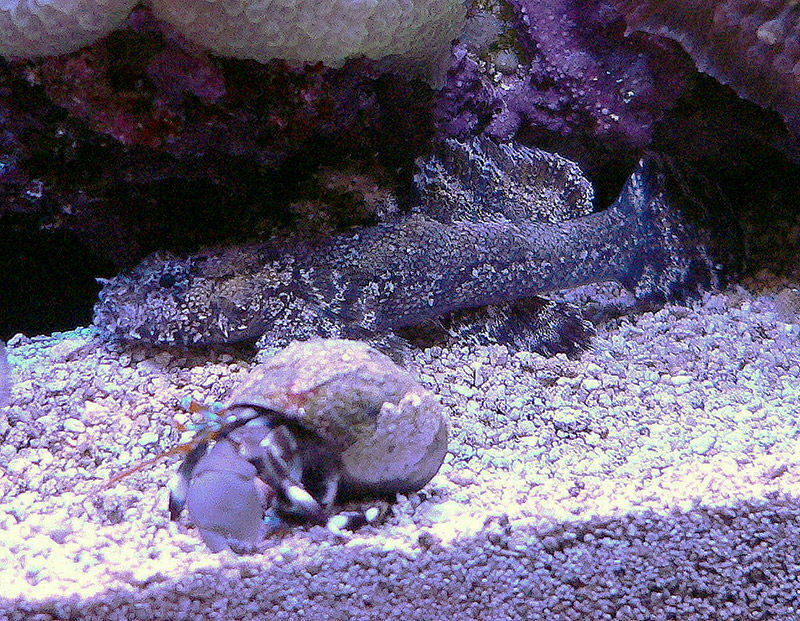 Calliogobious are an unusual fish for a reef tank, but I happen to like cryptic oddballs. If you don’t have access to marine live food, consider feeding chopped earthworms from a pesticide free garden once a week. I’ve been doing this for the last year or two and it does seem to help them retain their vigor as they get older. Corals: Since it’s natural in nature for coral to fight over turf, I have no problems if they interact in the tank. I only intervene if it looks like one or the other is in the process of being totally annihilated. If a coral's growth is impeding my cleaning effort, it gets trimmed/scraped/chiseled immediately. 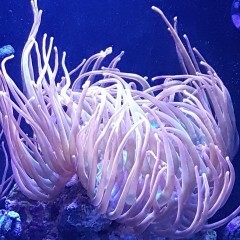 Every week when I clean I create a sustained ‘mini-cyclone’ in the tank with my turkey baster and the corals look fantastic for the next few days due to the increased oxygenation and the flood of potential food particles in the water column. NO3 & PO4: Some may have noticed that there is no mention of these two parameters as I don’t test for them in this very mature and stable tank. However, testing for new or younger systems is advised. Algae: As the tank has matured over time I’ve noticed a steady reduction in algae. As of now, I see just a few very thin stiff strands here and there that I pluck occasionally with a tweezers when I’m in the mood. I did have a little algae patch on one rock for the last 9 years, but that has now been reduced to virtually nothing and the area is being overtaken by coralline algae and colonial hydroids. ‘Natural System’ Methodology for Small Reef Aquaria: A bit of a misnomer perhaps as only nature is ‘natural’, but what the hobby calls a ‘Natural System’ can work well in any sized reef aquarium. This type of system does not rely on GAC, skimmers, GFO, ozone, etc. and I personally find the freedom of not having to fuss with these things most appealing. The simple nature of natural systems means that there is less than can go awry. And, in my experience, this translates in a better chance of long term stability and success. Although this is not my first nano (I built an 8gal with 12gal gravity-fed sump way back in 1985), this was my first true ‘mixed reef’ nano incorporating nearly all the major photosynthetic coral groups kept today. This system purposely has no Leather Coral or Gorgonians due to their propensity to release toxins into the water column. If one plans to keep a small reef going for a decade or more, consider carefully how to make the system as easy to maintain as possible right from the get-go. If a system is too complex and there are too many chores, fatigue and frustration will very likely set in and it just won’t be enjoyable. Have all cleaning tools in one easy to access location. The first 2-3 years tend to be the roughest. Considering the typical influx of new organisms, various pests and general instability (due to fluctuating bioloads and bacteria types/counts) it’s no wonder. This little system hit its sweet-spot after the 5th or 6th year, so be patient and persevere! Consider alternatives to using chemicals and medication in the reef tank itself whenever possible. Disturbing the system’s biological processes is often traumatic, sometimes to the point of failure. In such small systems, pests can usually be eradicated by manual means or, if necessary, treated outside the tank. Nano-Reef.com is still the best place for anything nano related and a big ‘Thumbs Up’ to the community members at large. I’d like to especially thank Christopher Marks for selecting this tank a second time around. Very well deserved. 🙂. Congrats!! Congrats on the 2nd TOTM! wow 10 years! so impressive! That's a sweet little tank. One of my favorite tanks! It still looks sparkling fresh 10 years later. I am looking forward to seeing its 15 year TOTM. Featured Reef Aquariums are selected each month from within the Nano-Reef Community, based on nominations from members and overall eligability. Our goal is to feature a wide array of saltwater aquariums, in all stages of life, to share the myriad of different ways in which successful aquariums are kept. 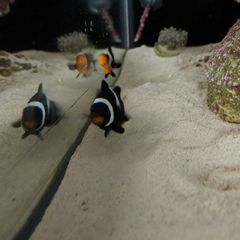 Eligible tanks are typically well documented in an Aquarium Journal, showing progress and growth along the way through photographs. Start a tank journal and share your aquarium with the community today! pricewayne's o-fish-al fluval 13.5G journal.